During the course of the meeting 40 founder members committed themselves to the formation of a new club. A lengthy discussion took place as to the name of the Club and after much deliberation North Eastern Counties won with 20 votes. Forty eight members immediately enrolled on a membership register. Mrs B. Bennett was elected as Membership Secretary, Mr Harry Woodward was elected President and Mrs R Scrivens was elected as Treasurer. The Chair was taken by Mrs Sheila Cole and she was elected the first Chairman. Mrs Pat Weeks had been taking the minutes and had done most of the ground work to form the club and she was duly elected as first Secretary. 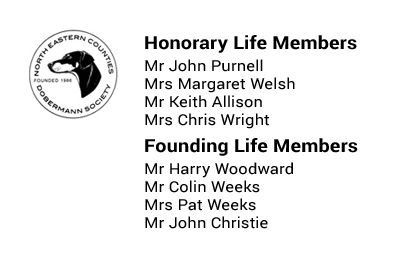 The first elected committee was taken from the floor (proposed and seconded in the usual way) and these were Mr P Norton, Mrs J Higgins, Mrs S Young, Mr A Whiting, Mrs M Welsh, Miss A Lonsdale, Mr G Young, Mrs S Stevenson, Mrs S Kerry, Mr T Farr and Mrs V Black. The Constitution and Rules were agreed and still exist today with little change. Twenty two members paid £2.00 each to cover the cost of registering with the Kennel Club and Mr G. Young paid for the use of the room. The meeting concluded and we all went our separate ways happy in the knowledge that the welfare of our beloved breed could be taken care of by a body of caring devoted people in the North East. Following the Inaugural Meeting the first Committee Meeting was held in the Red Lion Public House, Coxhoe the home of Mrs Welsh, on 11th May 1986 at which all committee members were in attendance. We also received another 38 names of people wishing to become members of the Society. The application to the Kennel Club was deferred at the meeting as it was felt that we should wait until we had 200 members (happy days). Mr Terry Farr was elected Match Secretary and was a great asset arranging many events including our first which was a Rally and Fun Day on the 22nd June 1986 at R.A.F. Catterick. A number of Fun Days and Dances were held at Catterick which were very well supported and were great fun. While the fun side of the Society was going on the more serious side of running a club was developing. We soon had the support of many other Dobermann Clubs throughout the country but it was hard work because as a new group running a new club we had to “prove” ourselves. By the end of 1987 the club was going from strength to strength to the extent that we had a waiting list of members wishing to serve on the committee and others offering their services in many different ways. During the formative years we held, exemption shows, fun days, discos, training sessions etc. Our first Open Show was held on 20th May 1989 at R.A.F. Catterick and the first Championship Show was held on 17th September 1994 at Sunnydale Leisure Centre, Shildon. The club now holds its Championship Show and Open Show on the same day in September.